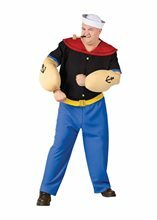 Popeye Adult Costume.Includes: Sailor Shirt with Collar, Pants, Belt, Anchor Muscle Tattoo Arms and Sailor Hat.Available Size: Mens - Standard. (See Size Chart For More Information) Material: 100% Polyester. *Shoes Not Included. 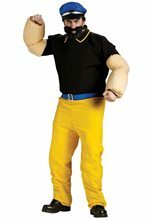 Pipe Sold Separately.An excellent men's costume featuring the costume from the cartoon "Popeye". This set includes a sailor shirt with square back collar flap, pants, belt, muscle arms with anchor tattoo and sailor hat. 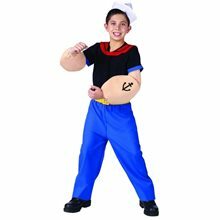 Popeye Child Costume.Includes: Blue pants with yellow belt, black shirt with red collar, muscle arms and sailor cap.Available Size: Child - Medium (8-10), Child - Large (12-14). (See Size Chart For More Information)*Shoes Not Included.Now you can be Popeye the sailor man! Blue pants with yellow belt, black shirt with red collar, muscle arms, and sailor cap. The costume available in medium and large child sizes. 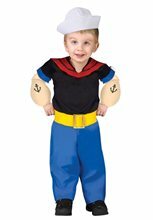 Popeye Toddler Costume.Includes: Blue pants with yellow belt, black shirt with red collar, muscle arms, and sailor cap. Available Size: Toddler - Small (24 Months - 2T), Toddler - Large (3T-4T). (See Size Chart For More Information) *Socks and Accessories Sold Separately. 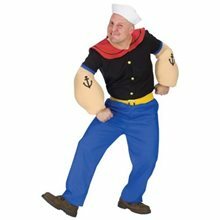 Popeye Costume includes blue pants with yellow belt, black shirt with red collar, muscle arms, and sailor cap. Please note that shoes are not included.